A blog about Greece's need to create a sustainable economic path for itself – and to do so quickly, in difficult circumstances, and under great pressure. Unemployment hit 16.2% in March 2011, continuing an upward trend that started in mid 2008 (May 2008 marked the low point at 6.6%). Not only has unemployment increased but it is getting worse: each of the last two quarters showed an almost two percentage-point drop in unemployment rates. 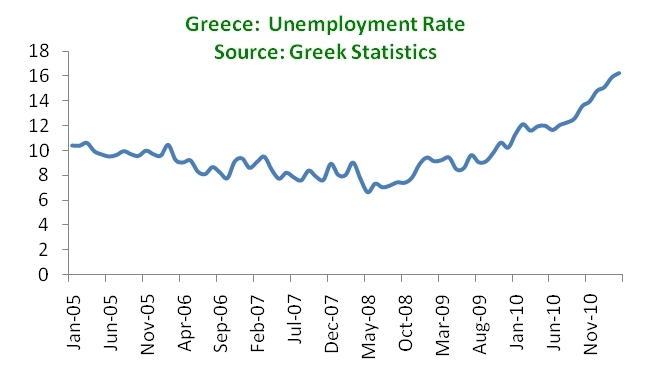 Let us examine in more detail what is happening (for a detailed look at unemployment trends, look at my past series here). 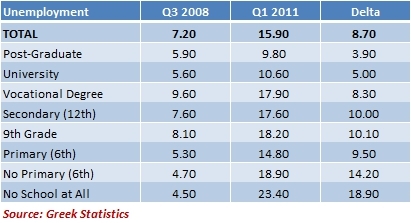 Begin with a snapshot of unemployment in Q1 2011. At that time, the population numbered 9.3 million, according to Greece’s Statistical Agency. Of that, almost 5 million was active in the labor force, a participation rate of 53.4%, which is almost identical to the rate in Q3 2008, before the crisis hit. The unemployment rate was 15.9%, amounting to 792,600 people. Now let us look at the demographics of those 792,600 people and also how those demographics have changed (I will compare everything with Q3 2008, the last quarter before unemployment really took off). Gender. There are as many men unemployed as there are women (48.5% to 51.5%). This parity, however, marks a stark deviation from recent trends. Since 2003, the ratio of males to females unemployed has been around 6 to 10, meaning that for every 6 unemployed men, there have been 10 unemployed females. Labor participation is lower for females (44%) than for males (63%), so the unemployment rate for women is much higher (19%) than for men (13%). 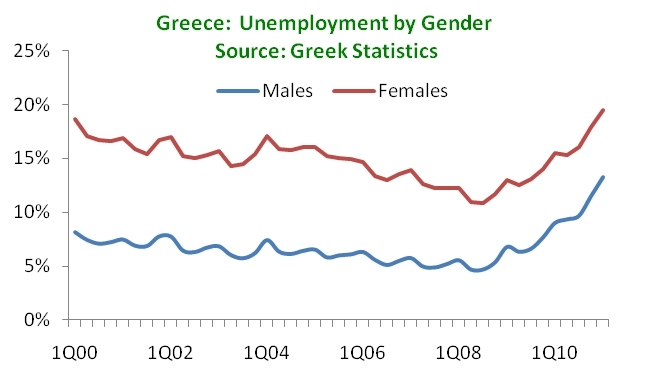 However, if one looks at the increase in unemployment since Q3 2008, around 56% has come from men. Age. 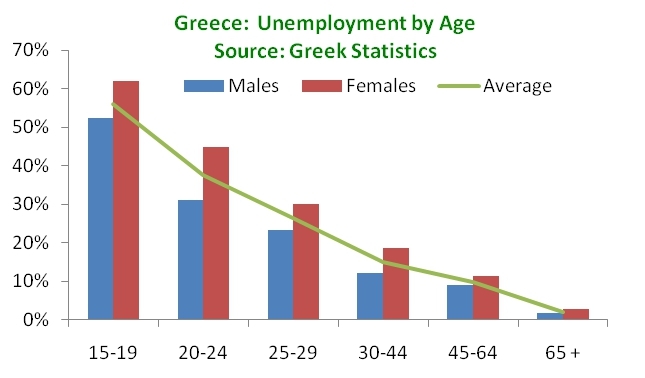 Around 40% of the unemployed are 30-44 years old. However, this age group also makes up 40% of the labor force, so its contribution to unemployment is proportional to its size. There is, though, a clear inverse relationship between unemployment rates and age: for those aged 15-19, the unemployment rate is 55%; for 20-24 year olds, it falls to 37%; and so on. 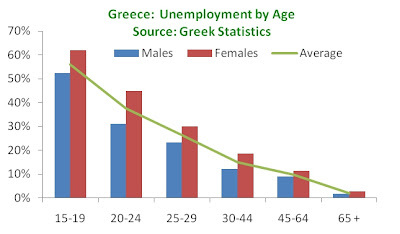 At each age group, there is a gap between female and male unemployment, although the gap is greatest at younger ages. Region. 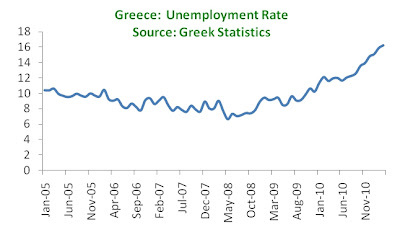 Regionally, Attica (broader Athens area) retains unemployment rates below the national average (14.7% vs 15.9%), as does Thessaly, the Peloponnese and the North Aegean islands. On the other extreme are the various parts of Macedonia, the Ionian Islands and the South Aegean. Most of these trends are in line with historical norms although some areas have seen less growth in unemployment than others. Education. There is clear trend between more education and more employment, but there is also a clear trend between education and how much unemployment rates have changed in the crisis. In Q3 2008, unemployment and education followed a bell-curve with the lowest unemployment rates found among those with the least and among those with the most education. But the crisis has hit those with less education more: in fact, the unemployment rate for those with the least education is over the national average (to be fair, the size of this portion of the population is the smallest). Even so, the change in unemployment is highest as one goes from those with post-graduate and university degrees to those with less education. Labor costs. In Q2 2010 labor costs came down on a year-on-year basis (vs Q2 2009) for the first time in over a decade, and they have since continued to fall. This adjustment is crucial to restoring some competitiveness in the economy, although the trend needs to continue in coming quarters. 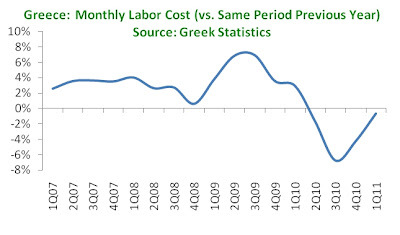 greekdefaultwatch@gmail.com Natural gas consultant by day, blogger on the Greek economy by night. Trained as an economist and political scientist. I believe in common sense and in data, and my aim is to offer insight written in language that is clear and convincing. 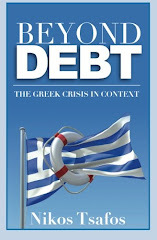 How on Track is the Greek Bail-Out Program?